I approached March 6th’s concert at Town Ballroom with barely any knowledge of Toronto-based pop star Lights. I had checked out some tracks on Spotify and could hear solid songwriting and an incredible vocal talent, but what I did not know -- and did not expect -- was that I was getting myself into a concert full of 16-year-old girls. I was expecting an intimate singer/songwriter setting and found myself in quite the opposite: a party. Lights (née Valerie Anne Poxleitner) put on a powerful, entertaining show. Her attitude, energy and message of empowerment are inspiring and her stage show was a visual tour-de-force. But first, we need to talk about the openers. First up was Toronto-based DCF. The rapper/singer, was dressed like a reject from an off-off-Broadway production of Hamilton, played a set of tepid pop music with no discernable properties. He performed solo, with a laptop and a few small mixers he occasionally adjusted. He told some stories, none of them interesting, to a crowd that barely acknowledged his presence. The autotune on his vocals was so thick he could have survived the evening without actually hitting a single note. I’m sure DCF is great for Bar Mitzvahs and high school dances, but his solo boyband routine was nothing more than an irritating waste of time this particular evening. Just when I thought the things couldn’t get any worse, Chase Atlantic came on a set of inoffensive bubblegum pop-rock. While the band played their own instruments, vocalist Mitchel Cave’s “white Jodeci” look -- complete with white-guy dreadlocks and an R. Kelly/Bobby Brown jacket-off-the-shoulder shrug -- ruined the whole thing. The bass and drums were pretty tight and the guitarist played well, but it was lost in the boom of the speakers. The songs felt like the same thing over and over, and I couldn’t help but think the best way to describe Mitchel Cave is a clown. I was happy when it was over. Finally, it was time for the main event. From the second Lights’ set began, the singer -- who evokes a 90’s era Gwen Stefani with a mound of bright red hair -- was bouncing off the walls. The three-piece band behind her was spot on and didn’t miss a note. A bright projection screen behind the singer, as well as some fog machine, gave her performance an extra kick. The projection screen mostly displayed a solid wall of color with some flickering, but a few points in the evening included animation from Lights’ upcoming graphic novel series Skin & Earth. She shared how she always dreamed of animating for herself, so she went on YouTube and figured it out. Her message of following your dreams seemed to resonate with the eager crowd. Lights played hits like “Toes,” “On We Go” (with a fun, louder arrangement), “Banner,” “Follow You Down” and others. She wielded full command of the crowd, who were practically eating out of her pixie-ish hands. You could feel the anticipation for the next power-packed chorus as soon the last one had ended. I went back and listened to Lights on Spotify after the concert. The music hadn’t really grabbed me at first like it did live, and I think that’s because the Spotify tracks have a flat feel to them. The music is overly compressed and seem to be missing a lot of Lights’ abundant positive energy. While good, it couldn’t compare to the live show. 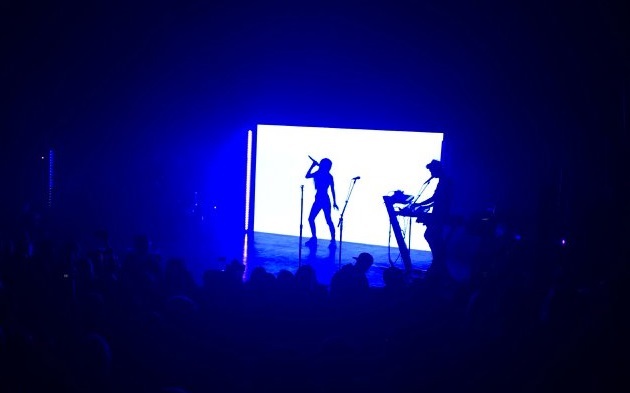 For the full Lights experience, you need to get out and see her live. Hopefully she comes back soon.